Should You Take an Internship After Graduation? Signing up for a clean energy internship is probably the last thing you want to do after graduating. However, for some, this can often be the best move to get the first permanent job in clean energy. Some clean energy companies hire graduates into clean energy internship roles that can lead to a permanent offer. They treat the role as an apprenticeship. You’re basically hired to prove yourself as a precondition to getting a permanent offer. 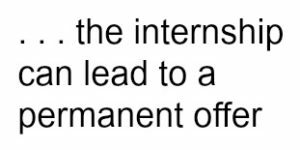 You should consider this seriously if (1) you did not land a great clean energy internship prior to graduation, or (2) even if you did, this is your only chance to get into renewable energy. You might even consider pitching this idea to a company that you’re passionate about even if they’re only looking for a summer intern. But be careful! Not all internships will satisfy this strategy. Make sure that the internship truly has long term growth potential. Companies often use interns for a few months (e.g., cold calling sales) and then reload with the next hire. Run!! That’s not what you want. Ask for specific examples of people presently with the company who started as interns. Furthermore, ascertain the specific performance criteria that you must meet to be hired full-time. Request the company to say how much time they need to determine if you qualify for a permanent role. The take-away point here is to remember that a clean energy internship might be a a stepping stone to get that first permanent job in clean energy. It’s a little counter-intuitive, kind of like, “your nearest exit may be behind you.” However, interning after graduation can be a relatively short detour to your desired clean energy career destination.